Mikael Brandrup is a Danish artist, hiding behind the pseudonym "KETS". He is a staunch autodidact who has already achieved a lot at his young age. Mikael discovered his artistic streak as a child: he drew little tattoos for his classmates, painted the walls of his friends' rooms as a teenager, and became more widely known when he began to spray graffiti under his artist name KETS in the streets of Copenhagen. At first, however, he did not have the courage to actually make a living as an artist, so he decided to begin training as a graphic designer. However, he dropped out of graphic design school after a short time to found his own design agency. The big breakthrough in the Visual Arts field happened to be by chance through social media when he posted a picture of a self-made world map that suddenly got thousands of likes and comments. This gave Mikael the courage to concentrate fully on his art and move to Los Angeles, where he has lived and worked ever since. 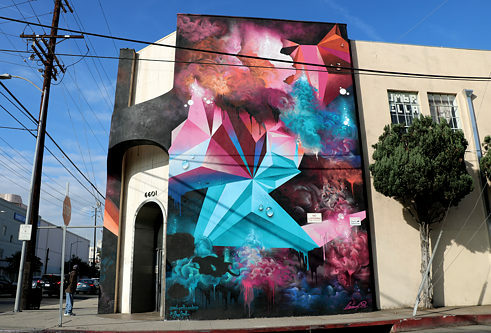 The move paid off with works for high profile companies including Google and Nike, as well as the presented Mural - a commissioned work created for American Express on Santa Monica Boulevard and Sweard in Hollywood. In addition to Murals, Brandrup creates smaller graffiti on canvas originals, which he exhibits in various galleries, from Los Angeles and Miami to Copenhagen.